Sage ACT! PRO is targeted to environments of 10 users or less. It works best in organizations where all Users share all data, and are physically located on the same Local Area Network. Sage ACT! PRO improves your efficiency by organizing all your Customer/Prospect’s data on one screen. Their recent emails, meeting notes, task reminders, and web-available information, social media profiles, living in one place makes it easy for you to quickly assess each Contact and maximize your personal relationship with them. With all your contacts in one database, and graphic reports, you can quickly analyze data trends and prioritize your focus. 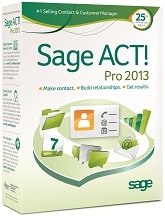 Many parts of Sage ACT! are semi-automated, giving you a built-in sales and marketing assistant to identify your target Contacts, send professional marketing campaigns, and measure your effective Return on Investment. The bottom line, Sage ACT! Pro takes reduces the administrative stuff so you can turn your Contacts into Contracts. SAGE Business Info Services enables you to harvest new lead info from Hoovers and drop them into ACT! Imports Company Financials, Key Contacts, Company News and Industry info with a couple of clicks! SAGE E-Marketing is a cloud-based email service that relieves your local email program of the burden of large email blasts. With a few clicks you can send professional HTML graphics emails to thousands of contacts, nurture those prospects automatically with Drip Marketing plans, and quickly identify your hottest leads using a ranked call list that tells you which prospects opened your emails. Basic Care gives a 12-months of technical assistance by phone, or live-chat, up to 3 incidents. 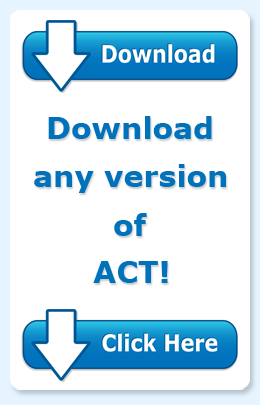 Bronze Care provides an affordable, subscription-based Upgrade Assurance program to keep you working with the latest version of ACT!, as well as discounted Online Self-Paced Training courses. Silver Care is Bronze Care plus 12-months of technical assistance by phone, or live-chat, up to 5 incidents, and $20 per additional incidents. Gold Care is Bronze Care plus a full year of unlimited technical assistance by phone, or live-chat, along with priority queuing for faster access to senior level support specialists, a guaranteed four business-hour response.